Thursday February 22nd 1894 We got up very early. Will brought two loads of wood from the valley. It was a big days work. I roasted the turkey and baked two pies for the church. was over awhile in the morning. I came back to get Will an early dinner. Hattie & Fanny were here late in the afternoon for a little while. I did up chores for I knew Will would be late. We spent the evening at home and went to bed early. 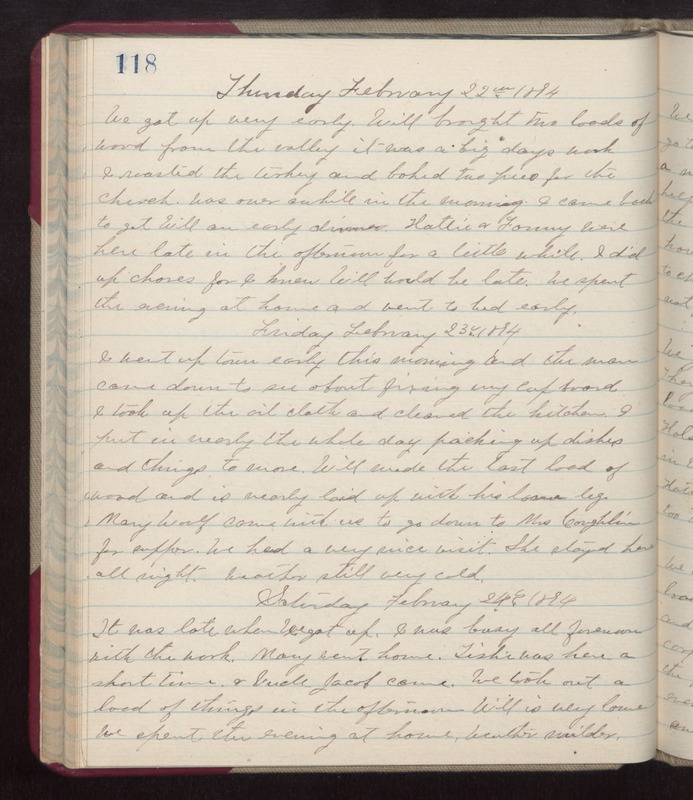 Friday February 23rd 1894 I went up town early this morning and the man cane down to see about fixing my cup board. I took up the oil cloth and cleaned the kitchen. I put in nearly the whole day packing up dishes and things to move. Will made the last load of wood and is nearly laid up with his lame leg. Mary Woolf came with us to go down to Mrs Coughlin for supper. We had a very nice visit. She stayed here all night. weather still very cold. Saturday February 24th 1898 It was late when we got up. I was busy all forenoon with the work. Mary went home. Tishie was here a short time & Uncle Jacob came. We took out a load of things in the afternoon. Will is very lame. We spent the evening at home. weather milder.